I’m always looking for new fun Indian recipes and love this cabbage theeyal! Theeyal is a dish made from roasted coconut, spices and tamarind. I think theeyal litterally means burnt dish since the toast the coconut until it browns. 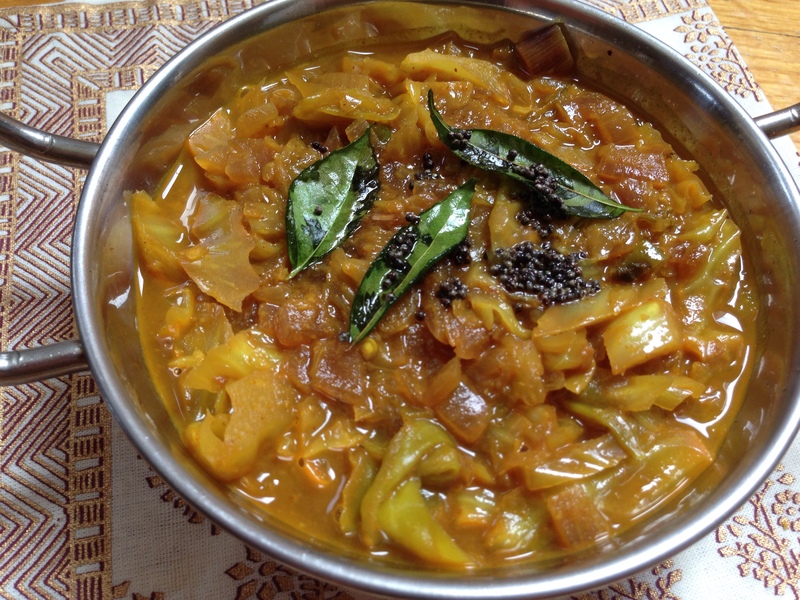 This recipe is adapted from this cabbage theeyal I found on Mareena’s Recipe Collections. We had it with a coconut yellow moong dal recipe from the same collection which I’ll post soon. Both were delicious and fantastic together! Heat coconut oil in a saute pan and saute onions until they start to brown. Add the cabbage and green chilis and continue to cook until the cabbage is wilted. Meanwhile toast the shredded coconut in a skillet until it browns. Stir often so that it browns evenly but doesn’t burn. Add the chili powder, turmeric and coriander powder and stir constantly until the spices toast. Grind in a spice or coffee grinder. Add the coconut spice mix, tamarind paste and water to the cabbage, bring to a boil, and simmer for a few minutes to let the flavors meld. In a tadka or other small pan, heat the rest of the coconut oil and add the mustard seeds. Once the start to pop, add the curry leaves and then throw into the cabbage.